UCLA’s Center for the Art of Performance (CAP) presents performances by Ryoji Ikeda on Thursday, Dec. 14, and Friday, Dec. 15, at 8 p.m. at The Theatre at Ace Hotel, 929 S. Broadway in Los Angeles. Ikeda, an internationally celebrated electronic composer and light-and-sound-installation artist, has gained a reputation as one of the few artists working convincingly across both visual and sonic media. A leading figure among the new crop of computer-based musicians, he is known for his moving-image, sculptural sound and new media works that explore the intersection between music and visual art through mathematical aesthetics. His work has been performed and exhibited worldwide at art and music venues and festivals throughout Asia, Europe and the Americas, and he has collaborated with such artists as choreographer William Forsythe, Japanese art collective Dumb Type, architect Toyo Ito, and photographer Hiroshi Sugimoto. His appearance at CAP UCLA is an opportunity to experience three of Ikeda’s concert works over two different programs. Program I features “includesformula [ver.2.3]” (2000–), which was made with Shiro Takatani and Takayuki Fujimoto, Ikeda’s collaborators from his time with Dumb Type. This constantly evolving work, updated with each presentation, is a perfect synchronization between sound frequencies and movements on the screen. It places the viewer in a binary geometry of space and exploits the darkness to amplify one’s perceptions. There is a complete integration of the various elements – music, images, lighting – orchestrating the relationships between them through a highly precise score. 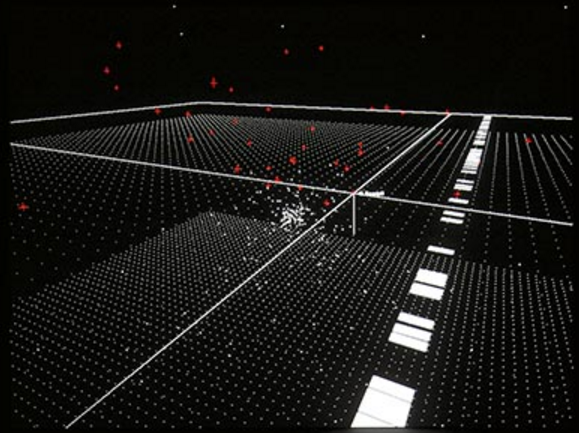 Program II, “featuresC⁴I” (2004–), is both a concert and a film that uses data as its material and theme, highlighting the ways in which data shapes our understanding of the world. Video images of landscapes are progressively abstracted into a language of data. Facts, figures and diagrams are used in a montage with dazzling graphic impact. Blurring the lines between nature, science and philosophy, the work subtly and hypnotically suggests the convergence of the real and the virtual. The soundtrack synchronizes perfectly with the graphical and video images to create a piece of undeniable power and beauty. The second half of each program features “datamatics [ver.2.0]” (2006–), an art project that explores the potential to perceive the invisible multisubstance of data that permeates our world. Using pure data as a source for sound and visuals, “datamatics” combines abstract and mimetic presentations of matter, time and space in a powerful and accomplished work. The technical dynamics of the piece, such as its extremely fast frame rates and variable bit depths, continue to challenge and explore the thresholds of human perception. Tickets are $15 for UCLA students, $25 for UCLA faculty and staff, $29.50 to $59.50 for the general public. To reserve tickets, call the UCLA Central Ticket Office weekdays between 10 a.m. and 4 p.m. at (310) 825-2101 or visit http://cap.ucla.edu. The Theatre at Ace Hotel can be reached at (213) 623-3233. Visit the artist’s website at http://ryojiikeda.com.